Rainer Keuchel has ported a lot of nice open source tools to WINCE, unfortunately no Openssh port is available for older CE-versions. If your device is >= CE 2.11 goto Rainers original port . openssh-wince-sh3-hpc-wce200.zip (Installation)(CELIB is needed) The included MSVCRT.DLL is also needed (for my machine [Ericsson MC16, German edition] if there is already a MSVCRT.DLL in your Windows-dir DON'T replace it!!! ), copy it to the WINDOWS directory like CELIB.DLL. SCP.EXE and SFTP.EXE are included. Detailed intructions for installation can be found here, please refer the "Registry"-section of Rainers Console docs too. It is a little bit weird, you have to do some registry settings too, especially UNIXROOTDIR must be setup. The files "$UNIXROOTDIR/etc/passwd" and "<samepath>services" must exist. The "services"-file must contain an entry for ssh on port 22. The "passwd"-file must contain an entry for root, uid 0. This is only used to look up the home directory. My examples "passwd" and "services". UPDATE: Al Wong has created very detailed installation instructions (Thanks)! The hole sourcetree (I am to lazy for the diffs, sorry !12mb!) , the CELIB sources are also required! Netcat is the extremely useful network swiss army knife. It is a nice command line tool and usable for a quick portscan, it reads and writes data across network connections and so on. For users who don't like command line unix-like tools (I like this stuff ;-) the very useful vxUtil (very useful but not as flexible as netcat, highly recommended freeware, should be installed on every networked WINCE-device) may be an option too. The original UNIX version was released in 1996 by hobbit and ported to windows by Chris Wysopal in 1998 (see @stake inc). My WINCE port is based on the Windows sources and is supported by Rainer Keukels CELIB and his great W32Console(NOT required, but recommended for scripting) tool. You will find some nice netcat tutorials in the UNIX and windows readme's (and of course, my readme is hopefully not completely useless ;-) . There is also a nice netcat tutorial by Tom Armstrong available. The sh3 wince 2.00 version also needs MSVCRT.DLL for the console (copy it to the WINDOWS directory like CELIB.DLL). netcat-wince-sh3-hpc-wce200.zip HP360lx, Ericsson MC16 tested and working! netcat-wince-sh3-hpc-wce211.zip HP Jornada 680 690 tested and working! IPAQ3630,Trium Mondo, Dell Axim, Sierra Wireless VOQ, HTC Windows Mobile 5 Smartphone tested, works at least with PocketPC 2000 and PocketPC 2002, should run on all newer CE4.0 (Pocket PC 2003) XScale -based PocketPC Windows Mobile devices too! Yes, it works with my new Windows Mobile 2003 Smartphone (Sierra VOQ) too (As expected also working with Windows Mobile 5)!!! and voila, netcat acts as a simple telnet tool! See the includes readme files for more options. For more interesting usage a console-tool like Rainer Keukels great w32console is recommended. 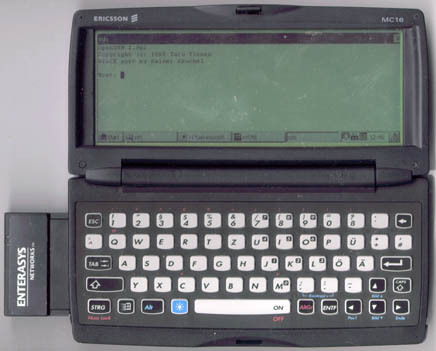 If you don't use a console on a PocketPC device please read the Netcat review at irongeek. All Netcat output will be written to nc-stdout.txt and nc-stderr.txt in the Netcat directory without a console.